Bismarck took part in only one operation during her brief career. She, and the heavy cruiser Prinz Eugen, left Gotenhafen on the morning of 19th May 1941 for Operation Rheinbung, during which she was to have attempted to intercept and destroy convoys in transit between North America and Great Britain. When Bismarck and Prinz Eugen attempted to break out into the Atlantic, the two ships were discovered by the Royal Navy and brought to battle in the Denmark Strait. During the short engagement, the British battlecruiser HMS Hood, flagship of the Home Fleet and pride of the Royal Navy, was sunk after several minutes of firing. In response, British Prime Minister Winston Churchill issued the order to 'Sink the Bismarck', spurring a relentless pursuit by the Royal Navy. Two days later, with Bismarck almost in reach of safer waters, Fleet Air Arm Swordfish biplanes launched from the carrier HMS Ark Royal torpedoed the ship and jammed her rudder, allowing heavy British units to catch up with her. In the ensuing battle on the morning of 27th May 1941, Bismarck was heavily attacked for almost two hours before sinking. 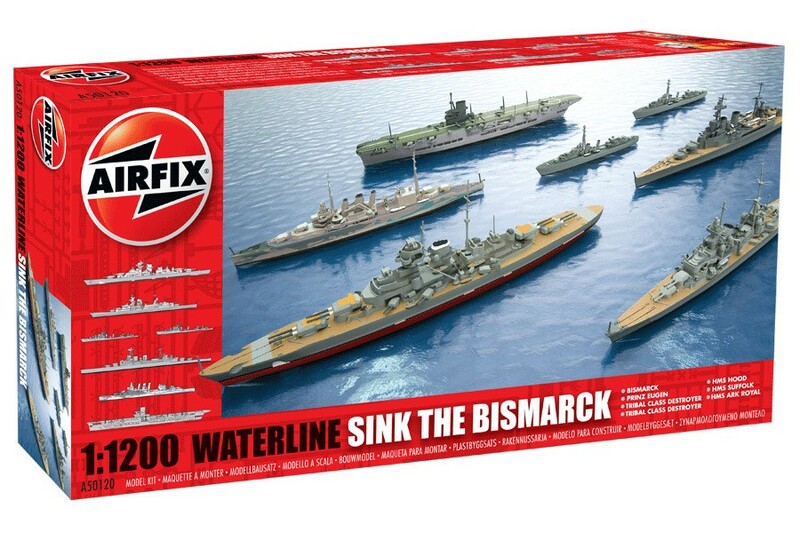 The six waterline 1:1200 scale models, HMS Cossack, HMS Suffolk, HMS Hood, Bismarck, HMS Ark Royal and Prinz Eugen, in this set represent the main ships in this action, and are a must for any warship modeller, collector or historian of any age.